Your name in lights! 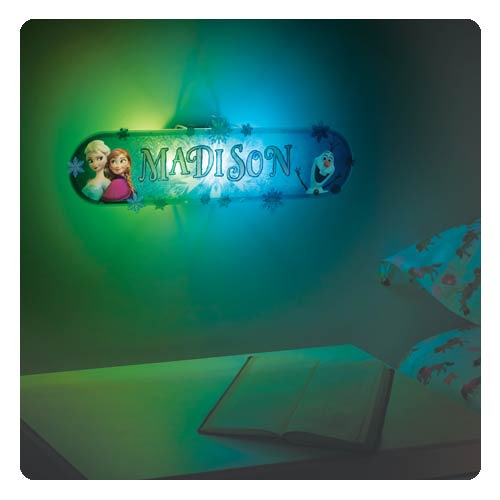 Make your own light-up nameplate or sign featuring the characters from Frozen. Customize your Disney Frozen My Sign with decorative transparent snowflakes, and see the beautiful multicolored lights fade in and out, highlighting your name in lights! It's easy to display on your wall and includes the nameplate with frame, a light pod, 4 frame supports, 2 letter sheets of letters A - Z (3 of each letter), a snowflake icon sheet, an adhesive dot sheet, and instructions. Light illuminates red, green, blue, and purple colors. Measures approximately 13-inches long. Ages 5 and up.